1. What are the key issues for the next academic year? We have decided that all PG courses will follow the semester system from 2009, while the same will apply to UG courses from 2010. This will ensure systematic and consistent work by students throughout the year. In addition, this year 3 new M. Tech courses will be introduced: Business & Technology, Materialism & Non-materialism and Organics. These courses are important in an energy-starved country like ours. 2. So, was the internal assessment the 1st step towards such a system? Internal assessment is necessary because teachers know their students better than someone who checks an anonymous answer script. I think we should include the grade system-1 and 2 marks donâ€™t matter- what matters is what youâ€™ve learnt and what activities youâ€™re a part of. Evaluations should be regular. Weâ€™re also thinking of introducing e-learning for students as a back-up for their classes. In addition, we plan to move towards a revised, credit system for PG and UG courses. Trying to introduce an Institution of Lifelong Learning (ILLL) will help in the direction of answering studentsâ€™ want for quizzes or tests or self-evaluation processes. 3. How can students get a grasp of key issues outside the classroom? The University Lecture Series, I believe, is a good way to start looking beyond the classroom. There is also a need to introduce more than adequate channels to connect all the colleges. The main challenge here is to make education stimulating and simultaneously to encourage extracurricular activities. Some ideas are to make the best 5 assignments, online tutorials etc. available for students to read. 4. 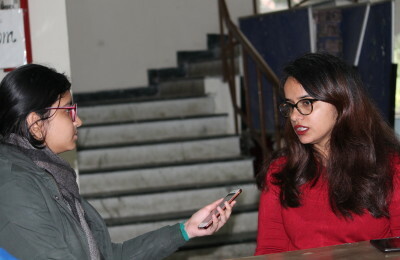 What is your opinion on the quota controversy and politics in Delhi University? When the Parliament passes something, the debate becomes dated. I donâ€™t want to waste time discussing it. We should make the most of the situation. 5. What is your opinion on reservations at the teachersâ€™ level? When people are nervous about their positions, they try to carve places for themselves to feel protected. Courses that are important for national development should see an increase in seats. Quotas are here to stay: thatâ€™s the reality of the situation. We need to find other creative ways to help students of merit around the country. 6. How can we ensure that merit prevails in the quota system? The only thing to do would be to ensure that the best students come through even in the general category. We increase the seats of those courses where employment opportunities and studentsâ€™ enthusiasm is present. 7. Recently there was a huge uproar about girlsâ€™ hostel closing early. What is your opinion about street security? I donâ€™t think there should be time limits in hostel, and we should rather focus on improving street security. 8. But who takes care of that, why is it such a huge concern? Headlines in newspapers scare people. Improving street lighting and continuing to talk to the police might help. The youth of today is very- if I can say- vigilant. Students should ensure that womenâ€™s security is functional on a large scale and there should be more student solidarity. We should work on reporting more complaints. For example, we have taken up many cases of sexual harassment, and many staff members have been dismissed from their jobs. Possibly, we could increase hostel accommodation instead of people living in private hostels. 9. What is your stand on the smoking ban in campus? I have mixed feelings about this. I agree that if someone wants to take a risk on his/her life, they should be given the freedom. But young people are not taking care of their health. I donâ€™t want to talk about smoking and drinking in particular, I feel the youth should emphasize more on physical exercise. 10. One of our readers wrote to us saying that the only difference this ban has made to him is now he walks all the way till outside the college gate. That is a form of exercise! But then, how many times will he do that. Itâ€™s a good thing, because eventually he will get tired of walking out, and his intake will decrease. Yes, I agree it is about personal freedom, but we need to discourage it. 12. While we are talking about personal freedom, when CCTVs were introduced on campus, a lot of people were a little uncomfortable with it. All these things need to be avoided- because it gets introduced only when a case comes up. I think privacy needs to be maintained. At least, college canteens should not have them. 13. How has the character of the DU student changed over the years? Options are more widely available, students are perpetually connected to the Internet. The exposure is huge but personally my concern is how much value are they adding to themselves while in college. Education is far more important than merely going in for a job. Also, I feel theyâ€™re not taking too many initiatives and their reading habits have decreased. Not many show a keen enthusiasm in knowledge. But I do realize the challenges todayâ€™s youth face. 15. Lastly, our readers would be interested in knowing what your favorite books are or the most recent one youâ€™ve read? Sudhir Kakkarâ€™s â€˜The Indian Psycheâ€™.